The world has been rocked by the 5th largest earthquake in recorded history, with a magnitude of 8.9, which is some 8,000 times more powerful than that which hit New Zealand recently. Such epic energy and power has destroyed towns completely, and even shifted the earth’s axis by 10cm, as well as the main island of Japan by 2.4 metres. Towns have been swept away with ships and trains missing. If that wasn’t enough over 250 aftershocks (and counting with most registering between 5-7 in magnitude) have been recorded, another tsunami warning issued, and an emergency with reactors No.1 and No.3 at Fukushima’s nuclear power plant. Yutaka Tozawa, a resident in Tokyo, and close friend of i-genius’ Creative Director, Barry Crisp, shares with the i-genius community his eye witness account (unedited). ‘The situation in Tohoku and Kanto (included Tokyo) in Japan is much, much more serious than you could imagine. Though huge damages were mainly in Tohoku area, but quakes bigger than the NZ quake hit Tohoku and Kanto again and again. Since the biggest quake in Tohoku, almost every single hour big quake has occurred here and there. I feel it’s something like war attacks. Not exaggerating! We can’t run away from next attacks. ‘In this few hours (now 5:30am on 12 Mar in Japan), almost every 20min, emergent quake alert was announced on NHK, and just after each of the official alerts, big quake hit north and east of Kanto Area. In fact, five or six quakes with more than ‘6-level’ (around M6.5 or more) hit Tohoku, Niigata, Nagano and Ibaraki in this two hours. Level 3 and 4 ones occurred uncountable times to the letter. Sounds like a quake loop has started. I think the biggest quake has impacted on active faults in huge area of Japan. ‘As to Tsunami damage, NHK tells that ‘at least’ 1,000 people in Tohoku might be the victims. 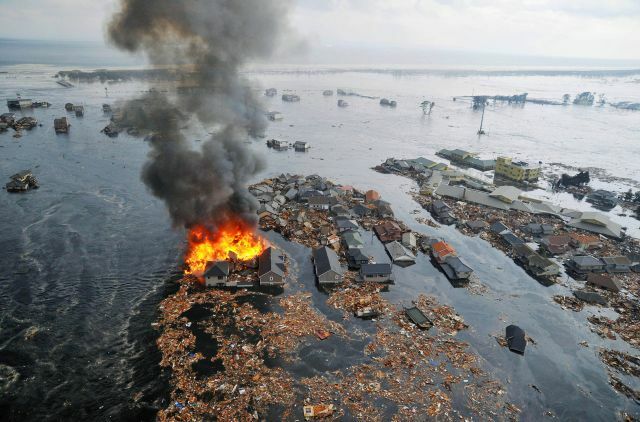 And, more than tens of villages were completely damaged by the Tsunami. Even villages more than 3 or 4km away from the coast were struck by Tsunami. After daybreak, more serious facts may be revealed. I’ve experienced lots of huge quakes since childhood in Japan, but I’ve never felt such a fear. ‘Continual’ quake attacks make me feel more than scary,’ reports Yutaka. Were the melon-headed beached whales in Japan five days prior to the earthquake a warning sign (as was the situation in New Zealand)? Scientists are begining to look into the relationship of animal and sea life behaviours in relation to natural diasters. Or is there a correlation between Supermoons and natural diasters!? The coming days, weeks, and months will give the world a clearer picture as to the total destruction caused in Japan, but we already know that the death toll will be in its thousands. Yet again, mankind is in shock and awe, and humbled by the evolutionary power of mother nature. You can follow live updates via BBC and Fuji TV. Our thoughts, prayers, and condolences go out to all those affected by the Japan earthquake and tsunami.